A decadent twist on the classic. 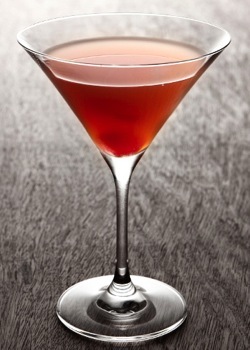 The Manhattan is a classic cocktail whose base spirit is Whisky, most often Rye or Bourbon. As bartenders and brown spirits lovers are discovering the great versatility of Rum we are seeing many versions of Rum based Manhattans. Our version is true to the classic showcasing the deep, rich, Bourbon-like characteristics of many great aged Rums. We stir our cocktail but if you prefer to shake, be our guest. In a mixing glass half-filled with ice add the Rum, vermouth, and bitters. Stir with gusto for 20 seconds. Strain into a chilled cocktail glass or pour over ice into a tumbler and add an orange twist if you like.